Jesuit Priests introduced the European harp to Paraguay in the early 17th Century, when they came to teach religion. This elegant instrument inspired the Paraguayans to make their own harp. The original version made in Paraguay was rather large and rustic like the European harp, but as time went by it was reduced to a much smaller size. The Paraguayans are master craftsmen in producing this instrument, and use pine and cedar wood that has been seasoned for many years. Today, with its 36 nylon strings, the harp has a very bright and loud sound. This sound, specific to the Paraguayan Harp, as opposed to the Classical, Irish, Welsh, Venezuelan, Mexican or other harps, has a lot to do with the fact that Paraguayan harpists play with their fingernails. The Paraguayan harp has several features that make it an outstanding harp. The neck is designed so that the strings come from the centre of the neck, eliminating the tendency for the neck to roll over to the left because of the string tension. Since the pillar and soundbox don’t need to be extra strong to accommodate this unbalanced tension, the whole instrument weighs far less than a comparable Irish harp. The Paraguayan harp weighs just around 12 pounds if not equipped with sharping levers, and about 16 pounds with sharping levers. 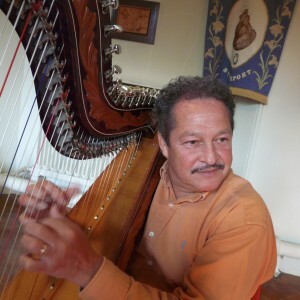 The Paraguayan harp is lightly strung, and has the largest bass volume of all the harps played today. The upper register is very bright. Contrary to popular belief, virtually any type of music can be played on the Paraguayan harp, especially if it has sharping levers.